Not sure about that mountain though. Any ideas guys? It does say Adventureland. Peek at the bottom of the mug. Hello. Do you have a picture of that? Thanks! Let me see if I can find one. I already have one that has been reserved for me. Just not in my possession yet. I was unable to easily locate the picture that I saw earlier of bottom of mug. Mugs that don’t have a description of what the artwork was based off of have the “FAC” number below the Starbucks stamp on bottom of mug. Ones that have description of what inspired the art have the FAC number up at the top and description of inspiration below. I think the mountain is supposed to be the waterfall in the Jungle Cruise. The “backside of the water” joke is a standard part of the Jungle Cruise script. There is a new magic kingdom cup! That’s right Jennifer. I have just added it to the site! I don’t remember waterfall there. 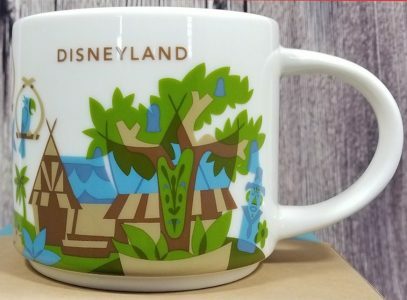 Can you still get this mug at the park with the new release of the haunted mansion cup?